I have been using the Google Chrome Cr-48 Notebook for about a two weeks, so I’d like to update with a few more impressions now that I’ve had time to use this for while. I forgot to mention in my previous post that I am not being paid to blog about this by Google or anyone else, though Google did send me this piece of hardware after I applied to their Pilot programme. I’ve been using the Cr-48 as my main home computer since I received it, eschewing my desktop for the Cr-48’s portability. For the most part, I didn’t miss using my desktop computer. 80% – 90% of my home computer activities are browser-based. The other 10% – 20% is comprised of gaming or other miscellaneous activities that I don’t do as often as web browsing. 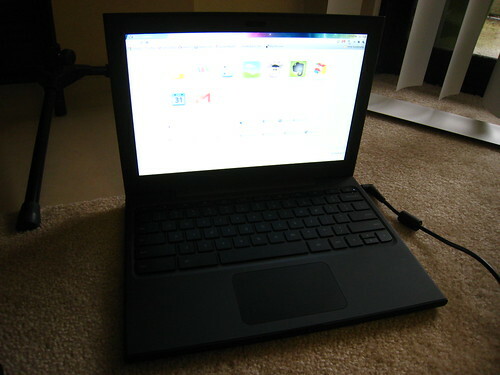 I have an Asus Eee PC 901 netbook, but I appreciate the Cr-48 for its larger screen. The Cr-48 is also faster than my netbook and just a lot more comfortable to type on for extended periods of time because of the full-sized keyboard. When I use this computer, I actually do use it on my lap and I don’t have it set up on a table or desk. Generally I’ve been using this in my living room, sitting on the sofa. Its portability is beneficial to me, because sometimes I want to check something online whilst watching a DVD or playing a game. The only other comments I have to add are related to the hardware. I’m not sure there’s much point to this commentary, as I don’t believe the Cr-48 laptops are intended for sale to a consumer. However, the hardware does have an impact on its usability for me, so I’ll talk about it. I dislike using tap-to-click on any trackpad. Tap-to-click is just not user-friendly for me, because I end up accidentally clicking when I just meant to mouse over something, or accidentally selecting things I didn’t mean to. Just as I disabled this feature on my Alienware m11x laptop, I likewise disabled this feature on my Cr-48. As such, all of my clicking activity relies upon pressing the trackpad down. The entire trackpad is not universally responsive. The bottom half tends to be more responsive than the upper half, leading to an inconsistent and sometimes frustrating experience. Clicking and dragging is regularly frustrating because I need to drag my finger across the entire trackpad surface, and if the whole of the trackpad is not uniformly responsive throughout, this leads to a lot of dropped selections as the tip of my finger traverses from a more responsive part of the trackpad to a less responsive area. This inconsistency leads me to press down on the trackpad much harder than I’m comfortable with when dragging items because I don’t want the pointer to drop whatever I’m dragging until I want it to be dropped. This issue with the trackpad leads to some frustration when doing simple things like re-ordering tabs in the browser, and extreme frustration when selecting and moving text. The trackpad is probably the worst feature of this notebook. The Cr-48 is heavy. This might be a stupid connection to make, but this laptop runs on a browser, so why is it so frakking heavy? It’s almost as heavy as the Asus W3J laptop I bought four years ago, which has more moving parts in it, like a spinning hard drive and a CD-ROM drive. The Cr-48 is just running Chrome OS. Why is this thing not as light as or lighter than my partner’s Toshiba Portégé R700 that (granted) has a solid state hard drive (no moving parts), but also has a DVD-ROM? I know it might be illogical to judge hardware features based upon the software a computer runs, but you know what? I’m not an engineer, designer, or developer. This is the thought process that actual consumers-who-are-not-computer-engineers may have, despite the fact that it may be illogical. Because Chrome OS laptops will be running Chrome OS, which is essentially a browser, there may be a consumer expectation that the hardware matches the software in terms of being lightweight. Apart from the hardware, using Chrome OS is working just fine for my everyday browsing needs. Would I buy a Chrome OS notebook in the future (if I didn’t have this one already)? Given that I have two laptops and a netbook already, probably not. Is there a consumer for Chrome OS? I’m not sure. Maybe, but it’s a crowded market. Thank you for your insights into this Chrome OS notebook. I applied for the pilot program, but apparently I didn’t make the list, so I’m very curious about other people’s experiences with the Google laptop. Regarding the weight of the unit, I would wager a guess that Google wanted to save a few dollars for what is essentially a Beta test unit. Being an Apple fan-girl, I know that ultra-miniaturisation = higher cost, so I imagine that Google chose some cheaper, off-the-shelf components to keep costs down. You definitely have a valid point about the weight of the hardware though! It seems to me that the Cr-48 should weigh about the same as a MacBook Air. Thanks again for your review. I look forward to hearing more about your future experiences.